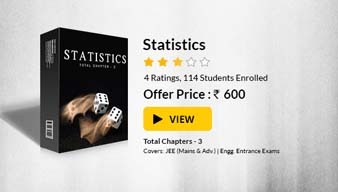 How to calculate Conditional Probability? The events which are not affected by another events are known as Independent Events. The event of getting a 6 the first time a die is rolled and event of getting a 6 the second time is completely independent and isolated. The events which are dependent on other events and they can be affected by previous events. In probability theory, Conditional Probability is a measure of the probability of an event given that (by assumption, presumption or evidence) another event has occurred. 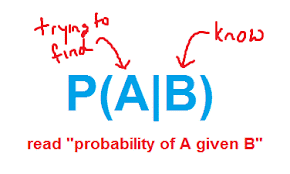 If the event A is unknown and the event B is known or assumed to have occurred, "the conditional probability of A given B", or "the probability of A under the condition B", is usually written as P (A|B), or sometimes PB (A). Example, the probability that any person has a cough on a day may be only 5%. But if we know or assume that the person has a cold, then they are much more likely to be coughing. The conditional probability of coughing given that you have a cold might be a much higher 75%. Let S be a finite sample space, associated with the given random experiment, containing equally likely outcomes. Then we have the following result. Let S be a sample space associated with the given random experiment and n(S) be the number of sample points in the sample space S. Since it is given that event B has already occurred, therefore our sample space reduces to event B only, which contains n(B) sample points. Event B is also called reduced or truncated sample space. Now out of n(B) sample points, only n(A∩B) sample points are favourable for the occurrence of event A. 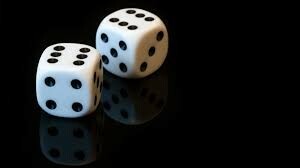 Therefore by definition of probability. Consider a country with three provinces B1, B2 and B3 (i.e country is partitioned into 3 disjoint sets B1, B2 and B3). To calculate the total forest area knowing the area of provinces B1, B2 and B3 as 100Km2, 50 Km2 and 150 Km2. obviously, we will add all the three provinces areas to get total area of forest. 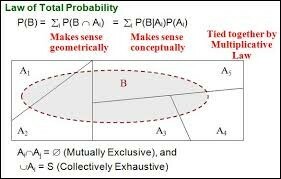 The same is the idea behind law of total probability. 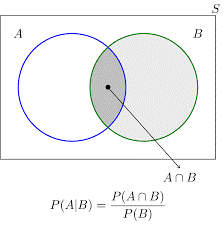 In which the area of the forest is replaced by the probability of an event A. In a case where the partition is B and B’ , then for any 2 events A and B.
Q1. Find the probability that a single toss of die will result in a number less than 4 if it is given that the toss resulted in an odd number. Q2. The probability that it is Friday and a student is absent is 0.03. Since there are 5 school days in week, the probability that it is Friday is 0.2. What is the probability that a student is absent given that today is Friday. Q3. A jar contains black and white marbles. Two marbles are chosen without replacement. The probability of selecting a black marble and then a white marble is 0.34, and the probability of selecting a black marble on the first draw is 0.47. What is the probability of selecting a white marble on the second draw, given that the first marble was drawn black? Q4. If P (A’) =0.7, P (B) = 0.7, P(B/A)=0.5, find P(A/B) and P(AUB). drawn is a yellow ball. We have to calculate P(A) which definitely depends on A1 and A2. P(A/A2) = Probability of A when A1 is already happen. given that the student is taking Science? Sol. We need to find the probability of English given Science i.e. P (English | Science) = P (Science and English) / P (Science) = 0.087 / 0.68 = 0.13 = 13%. Q3. A jar contains red and green toys. Two toys are drawn without replacement. The probability of selecting a red toy and then a green toy  is 0.34, and the probability of selecting a red toy on the first draw is 0.47. What is the probability of selecting a green toy in the second draw, given that the first toy drawn was red? Sol. Clearly it is a question of conditional probability. We need to find the probability of drawing a green toy having known that the first toy drawn was red. P (green | red) = P (red and green) / P (red) = 0.34 / 0.47 = 0.72 = 72%. Q4. At ABC Senior Secondary school, the probability that a student takes Science and English is 0.087. The probability that a student takes Science is 0.68. What is the probability that a student takes English given that the student is taking Science? Sol. We need to find the probability of English given Science i.e.